If the purpose of art is to provoke and cause a reaction, she has certainly succeeded. The nature of the painting makes us reflect over why we might be shocked or offended by it – and that is a useful reflection to have. The mural has been there a few days now. Let’s see how long it lasts! Stockholm’s Photography Museum is, in my opinion, one of the world’s best museums for seeing photographic art. 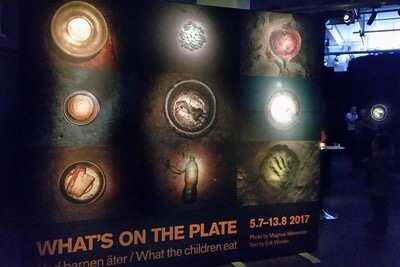 If you haven’t been, I recommend one of the current exhibitions called ‘What’s on the Plate’ by Magnus Wennman and Erik Wiman. I saw it today and it is no easy exhibition to see. In fact it is very difficult to stomach. In picture and text, you see very recent depictions of starving children around the world and what they are forced to eat in order to survive. The exhibition asks for donations towards Save the Children. It is well worth a visit and runs until 13 August 2017. It is a sobering and humbling experience and a reminder of the overindulgence of our daily lives and the vast gap between the ‘haves’ and the ‘have-nots’.